These malaria symptoms can vary depending on the type of plasmodium which caused the infection. Plasmodium falciparum take 7 to 14 days to show any symptoms of malaria while ovale and vivax take 8 to 14 days. Plasmodium malariae take 7 to 30 days. 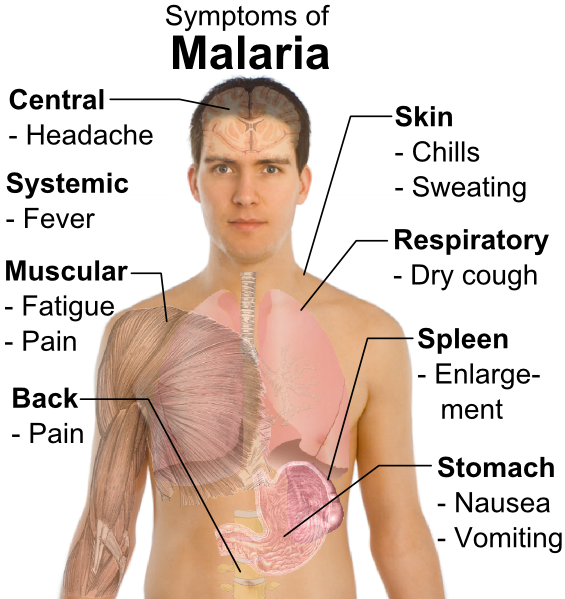 Symptoms of malaria disease are not always considered as dramatic. Malaria symptoms usually appear and disappear in phases. The cyclic malaria symptoms are due to malaria life cycle. There are also cases when malaria symptoms appear after 12 months when patient was bitten by a mosquito. People with malaria risk are those who are bitten by Plasmodium falciparum parasite carrying Anopheles mosquito. thanks..now i no about this weee..